It is important not to expose vulnerable pups to potentially dangerous diseases until then. When the time comes to start going out for walks, as well as traffic, your pup will meet all manner of new and odd looking objects; you may take them for granted but he might find some alarming at first. You can begin to prepare him for these while practising your lead walking skills at home by setting up a ‘confidence course’ in the garden. You can use all sorts of objects: dustbins and filled dustbin bags, plastic cones, plastic bottles, ladders, poles, boards, plastic sheeting, trays filled with gravel, door mats, tyres — anything you can think of in fact! Start with a few different things and move them so they aren’t always in the same place and gradually introduce new ‘obstacles’. If you don’t have much space simply rotate the ones you use. Walking around and over a variety of objects and surfaces will help to boost your pup’s confidence, increase his experience, help improve his balance, and develop his self control. This will make it easier for him to cope with anything out of the ordinary when he starts venturing further afield and also helps keep lead walking lessons at home interesting and stimulating for both of you. Pups learn things most easily before 12 weeks of age so should be exposed to as many different experiences as possible. Over-exercise at this stage can lead to joint problems. 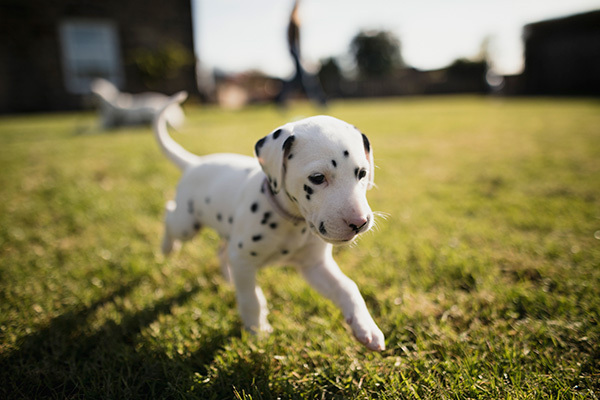 When you begin taking your pup out for walks aim to educate rather than strenuously exercise him — getting out will allow you to begin to introduce more new sights and sounds. Long walks aren’t a good idea and can stress growing joints and muscles leading to future health problems; a 10 or 15-minute stroll two or three times a day will be plenty for most dogs until at least six months old (older for large breeds), when you can gradually increase the length of time you’re out for.